The M&P Shield 9mm is an amazing gun, which is sworn on by hundreds of thousands of gun owners. It is not hard to see why. The Shield packs all the stopping power of larger pistols into a compact design that is easy to conceal. If you already own a Shield, or are considering getting one, it is worth getting a good IWB holster to go with it. A good holster will afford you a good level of protection against accidental discharge, and allow you to carry your pistol in deep concealment all day long. But with so many IWB holsters to choose from, getting the right one can be a daunting task. That’s where we come in. After looking at some of the most popular holsters for the Shield, and reading hundreds of reviews, we would recommend the Alien Gear Cloak Tuck 3.0. The materials this holster is made from are extremely hard wearing, and require no break in period. In addition, the variable ride height, cant, and retention features mean that you can find the perfect carrying position for this holster, without compromising on weapon retention or draw speed. Shield 9mm pistols are used by so many different people in so many different applications that trying to choose an IWB holster that will suit everybody is a little difficult. Nonetheless, in this review we have prioritized a few factors. We bet that if you need a holster for your Shield 9mm, you want to carry it concealed. Therefore, we’ve chosen holsters that offer a good level of concealment, whilst still including a good range of safety features. Whilst minimal holsters often seem like they will offer the best concealment, in reality they offer much less protection than hard body holsters. If you are carrying your pistol for long periods, you need to know that it is safe. 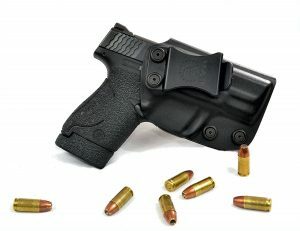 With any holster, including an IWB holster for your Shield 9mm, the first thing you should look for is weapon security. The consequences of accidental discharge, or of dropping your gun, can be severe. Some of the best holsters available for your Shield 9mm now offer fully adjustable retention screws. These mean that it is possible to adjust the tightness with which the holster grips your weapon. This is useful if you own several similar weapons, because you can adjust the holster for each. Today, we are reviewing inside waist band, or IWB, holsters. Thie type of carrying position is favored by those who carry their pistol concealed, as it offers a good defense against printing. That said, if you are new to carrying a weapon regularly, it is worth reading up on the differences between IWB and OWB, as different people prefer different styles. If you carry your pistol concealed, it goes without saying that you want a holster that hides your weapon well. With the Shield 9mm, any IWB holster is going to offer a good level of concealment, because you essentially have a small gun tucked inside your pants, though it is also worth reading up on how to conceal your weapon. This is, in our opinion, the best all-round IWB holster you can get for your Shield 9mm. The major advantage of this holster is the level of adaptability it allows. With variable ride heights, cant, and retention, you can set up the holster exactly how you need and want it. Everybody prefers a different style of carry when it comes to their hand gun, and in a life-threatening situation you need a holster that will allow you to draw quickly and reliably. The materials used in this holster are great. Whilst we know that some people prefer the look of leather holsters, the fact that the extruded plastic used here can be easily cleaned and requires no break-in period is great. The molding of this holster is custom-made for each weapon, so you can be assured that it will fit your Shield 9mm like a glove. 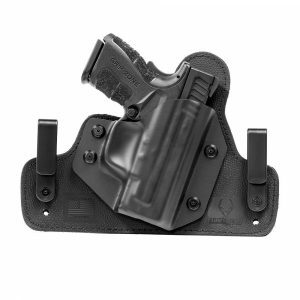 This reduces the profile of the holster, and also offers an additional level of weapon retention. This holster also comes with a lifetime warranty, proving the faith that Alien Gear put into their products. The people we talked to for this review reported that this holster had provided them with many years of reliable service. As for disadvantages, in truth we can find very few. This is not the most slimline holster we have reviewed, but its other features more than make up for this. This is a really solid IWB holster for your Shield 9mm, and was only beaten to the top spot in our review today because of the superior adaptability of the Alien Gear Holster. That said, this holster offers all the features you would expect from a modern holster for your Shield 9mm. In particular, the materials used here feel very rugged, and we are sure that it will provide many years of reliable service. This holster is slimline, whilst also providing a good deal of protection for your weapon. It offers a great compromise between concealment and safety. The Boltaron plastic used for this holster is more hard-wearing than almost any other material used in similar IWB holsters for your Shield 9mm. It offers superior impact and thermal resistance, useful if you are carrying in extreme environments. This pistol also offers variable cant, which can be adjusted from 0 degrees to 15 degrees. If you prefer to carry your pistol at an unusual angle, this holster is a good option. As its name suggests, this holster is designed to offer superior concealment. If you live in a hot climate, where light clothes are the norm, and want to reduce printing whilst carrying your weapon concealed, this is the IWB holster for your Shield 9mm. The “posi-click” audible retention system is a great feature, and unusual on such a minimal holster. When holstering your weapon, an audible click lets you know that it is safely stowed, offering great peace of mind. If it’s important to you, this holster is entirely designed and made in the USA. This also ensures the highest level of workmanship. As for disadvantages, obviously this kind of slimline holster is never going to offer the same level of protection as its larger brothers. The trigger guard mechanism here might be too basic for some, but for most people will be sufficient. 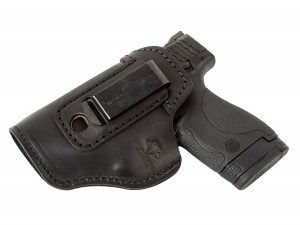 If you a looking for a leather holster for your Shield 9mm, this is a great option. Whilst we are often skeptical of leather holsters, this holster offers a good level of protection. In addition, it offers all the advantages of classic leather holsters – it will slowly mold to your weapon the more you use it, and after a few years will feel like a part of your body. And, of course, the lack of bulky extruded plastic casing means that it offers a great level of concealment. The material used here is a high quality leather, worked by American craftsmen, so you can be assured that the workmanship here is of the highest quality. Although we are reviewing holsters for the Shield 9mm pistols here, it is worth noting that this holster fits a wide variety of guns. If you own a number of handguns, and want a holster that fits them all, this could be a good choice. What you should look for in an IWB holster for your Shield 9mm depends, to a great extent, on how you use it. 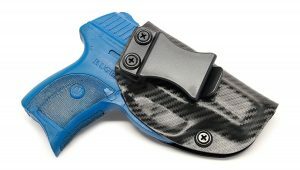 All of the holsters we have reviewed today offer a good compromise between safety features, comfort, and concealment. That said, we would recommend the Alien Gear Tuck 3.0. The materials this holster is made from are extremely hard wearing, and require no break in period. In addition, the variable ride height, cant, and retention features mean that you can find the perfect carrying position for this holster, without compromising on weapon retention or draw speed. Good review. Thank you. I’ve been carrying the Shield for a few years now (since it came out). I recently got an Exarchy Holster Patriarch IWB hybrid holster with a horsehide backer. I’m not sure why I waited so long. SO Comfortable. Best Holster I’ve ever owned. Lifetime warranty too. Check em out.